Live streaming is picking up in a big way. Most of it is done with a smartphone in the portrait orientation, but regardless, it’s more popular every day. You may have noticed the brands or companies you follow on social media have picked up on the trend too. Press releases are no longer one sheet propagated by trade magazines and news organizations. When someone wants to tell a whole lot of people something at once, they point a camera at their face and start talking. I wanted to put this article together to help anyone entertaining the idea of live streaming their next project to pull it off with as little headache as possible and to enter into the planning process with the correctly-tempered expectations. The task can be as simple as stated in the previous paragraph. All it takes is a smartphone and a Facebook account to start the most basic of live streams. I know people who have done it on accident. For some individuals, that may be all you ever need, but the creatively conscious person or company wanting to put themselves live onto the Internet with a heightened production value will need, at the very least, two things: a camera and a video encoder. The options for this seemingly simple setup are vast. Some cameras such as the JVC GY-LS300 are up for working double duty with a built-in encoder ready to stream directly to a video service of your choice. At the other end of the spectrum, the Livestream Studio HD550 lets you mix 5 HDMI/SDI cameras, 20 remote cameras, remote webcams, and even other streams into your live production. Live streaming is scalable. It’s important to know the scope of your project beforehand and to be prepared for the complexity of your shoot to scale the required planning and technical proficiency in equal measure. 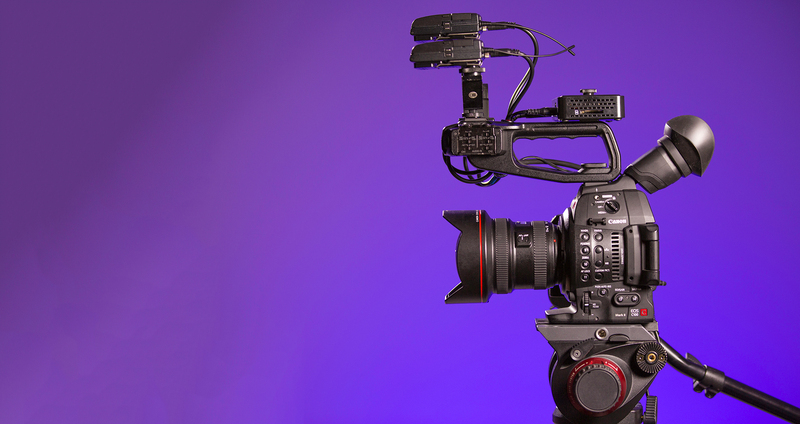 Below are the Lensrentals products you should look to when gearing up for your live production. The DJI Osmo Mobile paired your smartphone, and Facebook Live is the most turnkey solution, and if you’d like, other companies such as Livestream offer phone apps with richer feature sets for broadcasting. The DJI Osmo and Osmo+ also have built-in options for streaming to Facebook Live and their cameras provide a GoPro-like image that the three axis gimbal keeps buttery smooth. If you want easy, one of these options is your best bet. The Livestream Studio HD550 4K is a very capable addition to our live streaming rental options. Since this is a new product offering from us, I’ll give a quick overview of its features. At its core, it is a very powerful all-in-one Windows 10 computer (Intel Core i7 6900K Broadwell-E 8-Core 3.2 GHz, GeForce GT 730, 64GB DDR 4 RAM, 2TB Samsung 850 EVO SSD) paired with 5 Blackmagic design HDMI/SDI capture cards. The included Livestream Studio 4 software is full featured but also very intuitive. Just a few of the more interesting features are an integrated Google Chrome webcam interview application, the ability to mix in other RTMP streams, Apple AirPlay and Android mobile input options, and the capacity for up to 10 wifi-streamed GoPros. You can also elect to split a 4K feed into multiple 1080p signals that can then be switched as if they were discrete cameras. The unit is controlled via the included mouse and a Livestream customized keyboard that allows one-button access to most software features. Outputs are limited to one HDMI and one SDI port, but there is an additional HDMI port that can be used as an extended monitor. I think this product is a bit handicapped by audio input options. It’s not a problem if all of your audio is being streamed to the device by way of the video signals, but the only alternative to adding audio straight into your mix is one 1/8” and two XLR inputs that, so far in my testing, seem a bit noisy even before pushing the gain. If someone needs microphone or line level audio signals to be sent directly to the software, I’d recommend one of our recorders with proper mic preamps as a go-between. What else do you need? To start streaming, you also need to rent cameras and the corresponding video cables. If you need additional audio, I suggest an audio recorder such as the Zoom H4n Pro or the Zoom F8. If you go the additional audio route, don’t forget microphones and XLR cables. 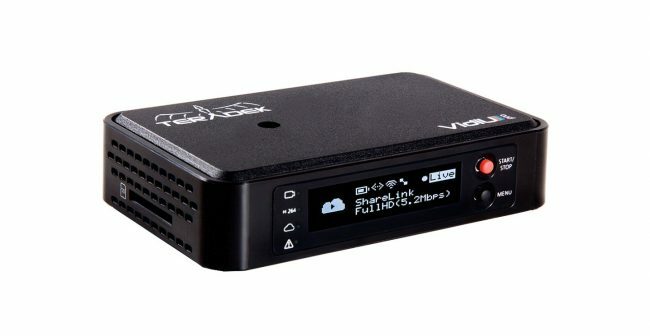 The Teradek VidiU is a small camera mounted solution that utilizes your phone’s LTE service, a wifi network, or a LAN connection to stream an HDMI signal to any RTMP streaming service. This is about as simple as live streaming gets. Connect the VidiU to the internet, enter your streaming service’s credentials, plug in your camera, and when the encoder is ready, hit the start streaming button. The internal battery only lasts about an hour, so be prepared to use AC power if your stream will be running longer than that. If you want the peace of mind of an SD recorded backup file and the option to use Teradek’s LiveLink signal bonding service we also offer the VidiU Pro. While it may seem easier to use a camera with built-in streaming, I find that the user interface Teradek has built makes for a much quicker setup and lessens the overall time-to-stream. What else do you need? To start your stream, all you need is an HDMI capable camera and HDMI cable. Occasionally you’ll want the option to switch between multiple cameras on your stream, and on the off chance you didn’t rent the Livestream HD550, you may not have that option with your preferred streaming device. Adding a video switcher into the equation opens up creative options but will also require a dedicated set of hands to run the operations of switching between cameras and other video sources during your stream. Live video switching adds a level of professionalism that is hard to achieve with one camera but will also significantly increase the complexity of your shoot. It’s always good to keep in mind that with more moving parts comes the possibility of those party breaking down during critical moments. The Roland V-1HD is a product I liked so much that I bought it after a just a few rentals. Off the bat, know that the version we rent is HDMI only which could hamper your plans dependent upon your camera’s video outputs and your tolerance for long HDMI cable runs. I like this product’s simplicity of use and breadth of features. It accepts four HDMI inputs and has two programmable HDMI outputs. Audio options include HDMI and stereo RCA inputs as well as a stereo minijack headphone output. Hooking the switcher up to a computer does allow for control via software but doesn’t add all that much or make using the V-1HD easier. Audio mixing, physical controls (turning knobs and sliding a t-bar is always fun), and picture in picture are just a few of the things that drew me to this switcher. Blackmagic has the ATEM which also does video switching but with a few differences. First, you lose the physical control surface for a computer interface. This does mean that a computer is required to use this product. You’ll need to connect via ethernet to do anything at all. It does offer eight total video inputs — half HDMI, half SDI. It has both HDMI and SDI multi-view and program outputs as well as stereo XLR inputs and outputs. If the quantity is what you need, the ATEM is your best best. In use, the unit is less impressive. Be prepared to separate the unit from any audio being captured because its fan is quite loud. Without a control surface, the ATEM is a bit cumbersome. For quick switching, some customization to the computer interface will probably be needed, and I suggest you take some time to learn the necessary keyboard shortcuts. What else do you need? You’ll need cameras, their corresponding cables, an Ethernet capable computer (for the ATEM), a streaming device or software, and patience. Introducing a switcher into your live stream always reveals a few unforeseen issues so allow additional time for setup and troubleshooting. I’ll make a quick mention of the cameras we keep that will do some sort of streaming without the need of a separate encoder. We rent two cameras from JVC that will allow streaming via wifi networks. The JVC HM650U and JVC GY-LS300 use similar means to stream to RTMP enabled services. This requires a complicated setup using a computer and web browser. 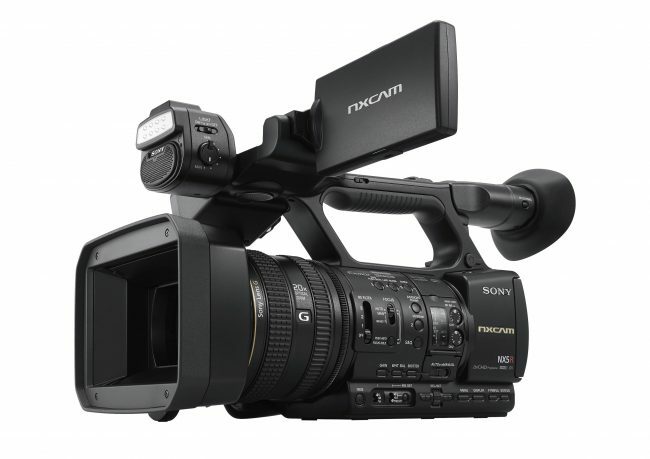 Sony has recently released the Sony HXR-NX5R NXCAM and touted the camera’s stream-ready state. Unfortunately, the only service currently compatible with the camera is Ustream, and Sony has stated no plans to make any changes to that. The JVCs will do if you need the absolute most nimble of live streaming setups, but I personally like the versatility of having a separate streaming encoder that more easily connects to the services that I need to use. In its current state, Sony’s NX5R is not a great option. With that introduction to the live streaming options we offer, you should be able to begin planning your production. As technology progresses, I only see the format becoming more prevalent. Devices will get smaller and more powerful, but the basic concepts should remain the same. In a future article, I will spell out use cases and examples of larger streaming setups with specific product recommendations. If you need help with creating a cart in the meantime, we’re always only a phone call or email away. I plan on getting into OBS in a future article. It’s a surprisingly powerful piece of software for being completely free. Thanks for your input. I’ve never seen the AVerMedia products. I’ll have to familiarize myself. For my personal use, I have a Blackmagic Design UltraStudio Express. They can be found for a couple hundred bucks used. They have one or two cheaper options as well, but they of course lose a few features. As @jorik90:disqus said, OBS is a great (FREE!) solution if you have a laptop and a video I/O device. I use it regularly for live streaming to Twitch and YouTube. As demand rises, we could increase our streaming options. We’re always happy to take suggestions for rental gear you would be interested in getting through Lensrentals. I use a set of two AVerMedia Live Gamer Portable Lite’s (<100$ each) to livestream two Sony A6000's (using HDMI-out) on YouTube using OBS Studio. Works quite well for a 1080p stream. Only downside is a input delay up to 300ms. A Sony A7 works fine too. Definitely! If you’re not running audio directly into your cameras (some cameras don’t have adequate microphone preamps or introduce too much noise) and instead placing mics around your set separately, the option to run audio into an independently mixed recorder (or mixer) with the option for backup may be enticing. It’s definitely a rare case and with our products above, really only something I’d recommend with the Livestream HD550. Specifically because the audio inputs on that unit are subpar. Since the Livestream is a computer at its core, you can setup the zoom recorders as an audio interface via a USB cable and run those inputs into the Livestream software. Josh, nice work. But could you explain a little further what role an audio recorder would play in a livestream setup. Do I use it to combine multiple microphones? And also, where does the output from the Zoom go?